The parasitoid wasp Telenomus podisi emerging from Euschistus servus stink bug eggs. The wasp is about 2 mm in length. As she developed, she consumed the bug inside the egg. Both the wasp and the host stink bug egg are native to the Eastern U.S. 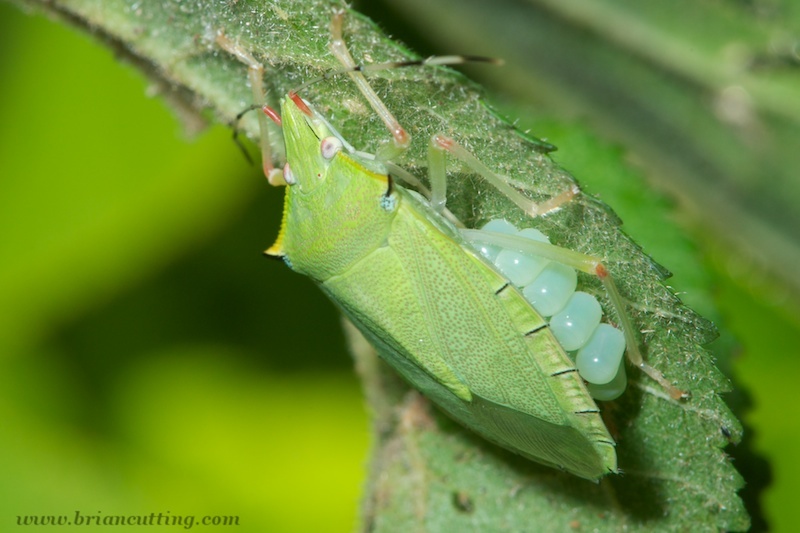 Defensive behavior: A Costa Rican stink bug in the genus Loxa defends her eggs by standing over them. She will use her hind legs to deliver a sharp kick to any intruders; enough to startle a human or send a small parasitoid careening through the air. Defensive form? 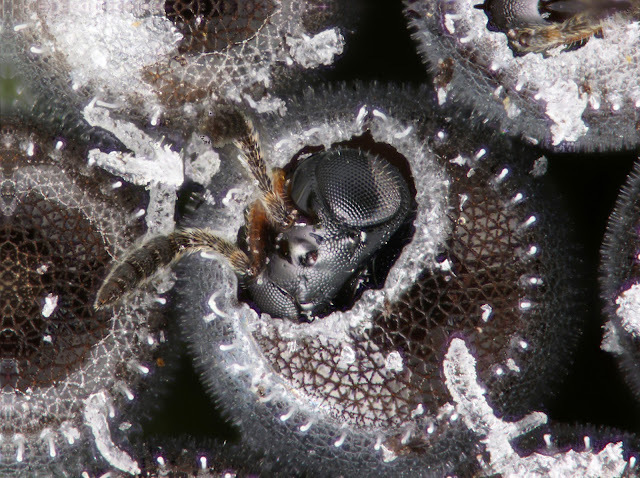 All stink bug eggs have micropylar processes - a ring of tubes that allow sperm and oxygen to enter the egg. Those of Podisus maculiventris are very long, forming a spiky crown around each egg. I wonder if they serve an additional purpose in interfering with the movement of small parasitic wasps among the eggs. Because parasitoid wasps are so effective at reducing populations of their hosts, they can be very useful for providing control of pest species. 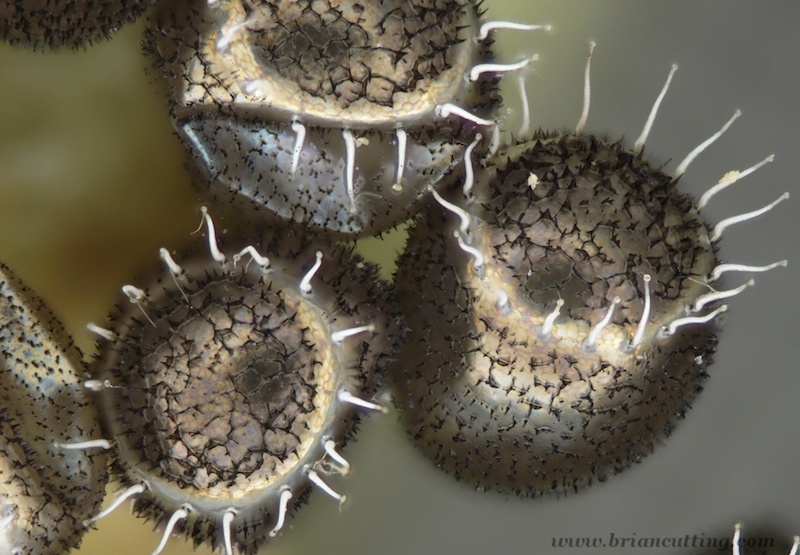 When one organism is used to control another, this is termed biological control. Current research is investigating certain parasitoid wasps as potential biological control control agents for the brown marmorated stink bug. 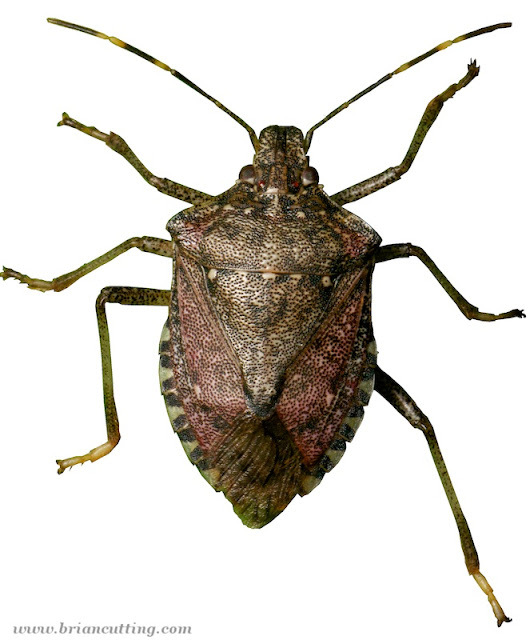 The brown marmorated stink bug is a familiar pest because of its annoying habit of hiding out in houses during the winter months. Unknown to many, it causes huge losses in agricultural systems and negatively affects the environment; farmers must spray more pesticides to control stink bugs. Researchers hope parasitoid wasps in the genus Trissolcus (a relative of the Telenomus wasp pictured above) will be able to provide control of the brown marmorated stink bug, without being a hazard for native stink bugs and ecosystem function. Because of the close relationship that many parasitoids share with their hosts, many will not attack other species. Halyomorpha halys, the brown marmorated stink bug. Originally from Asia, this insect is a serious agricultural pest and a nuisance pest in buildings. It is broadly distributed and has a growing range in the U.S. and worldwide.